Published on 23.02.2008	in 光影記事 and 電腦新知. 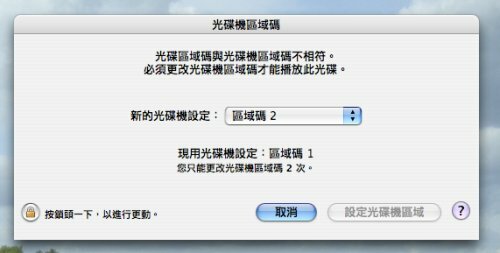 有無用 VLC 或 MPlayer 黎睇? 我相信不少朋友用 DVD Region-free 的軟件, 只要啟動功能後, 看哪一區的影碟也不受限制。不過好像沒有 Mac 版本啊! BTW, 用接駁至電視的 DVD 機/DVD-Recorder 不是更好嗎?